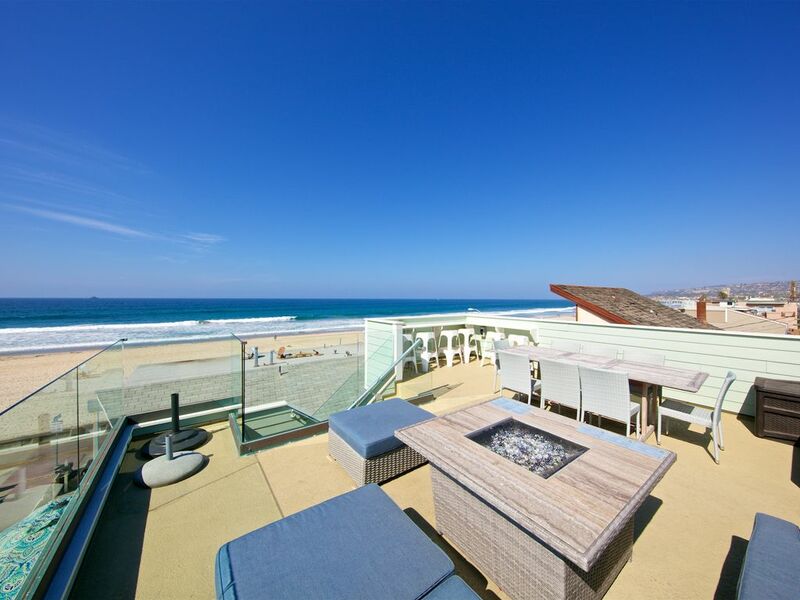 This wonderful custom designed beach home with its spectacular 360 degree roof deck views will take your breath away. When building, furnishing and decorating this nearly 2,000 square feet home, the owners with their long term “beach” experience paid the greatest attention to detail and created a truly stunning sophisticated retreat providing not only tremendous comfort but also lots of room outside to enjoy warm ocean breezes. This three-story plus rooftop entertaining beach jewel with its more than 5 decks is not even 100 feet from the oceanfront and only a short stroll from beautiful Sail Bay. Each level of the house offers brand-new furniture, bedding & bathrooms as well as the finest appliances. You can see the ocean from almost all rooms, decks, patio and even the kitchen. It does not get any better than this! Located 2 houses off the sand, you escape the busy boardwalk and yet you are just steps away from it and able to “jump in” toes in the sand and surf any time you would like. Each of the four bedrooms is equipped with a comfortable queen bed, fluffy comforters and flatscreen television. Fullsize sleeping sofa in living room. The first level of the house features a bedroom that opens to a spacious patio with ocean views. The bedroom is attached to a private bathroom that offers an extra big tub/shower, perfect for little ones to take a bath together Also, this home has a full two car garage and laundry facilities. After a beach day, in the side yard with the sand toys is a warm water shower to rinse away sand before re-entering Seagirt House. The second level features three bedrooms and two baths. The Master bedroom has its private bathroom attached with extra wide and deep tub/shower. It also offers a wonderfully furnished balcony with ocean views. The other two bedrooms share a bathroom with spacious walk in shower. One of the two guest bedrooms has a nice furnished balcony attached. On the third level you find a beautiful open floor plan featuring kitchen, dining and living area that opens up to a breathtaking and spacious terrace offering nice seating at four person table or two chaise lounges and spectacular ocean views. You can even see the ocean when sitting on the extremely comfortable couch in the living room. It's the perfect place to read, relax, watch TV on the big screen HDTV or gather with family and friends. The couch converts into a sleeping full sized bed if an additional sleeping option is needed. You also have partial ocean views from the kitchen window. You will love cooking in this fully equipped gourmet kitchen. It's stocked with everything you might possibly need. The dining table can be adjusted on size and sits up to 10 people. There is also seating for 4 at the big breakfast bar. The kitchen opens to a nice BBQ deck that offers a big brand new gas BBQ, a wooden bar table with 3 chairs looking out towards the ocean. In addition for your convenience, there is a spectacular pebble walled powder room with access to living area and roof deck. You can access the roof deck from the main living area going up some stairs leading to a huge 360 degrees view entertainers dream. The deck is surrounded by glass and offers the most spectacular views. It is fully furnished with six bar chairs, lounge couch with fire pit as well as a table with eight chairs. From here you can see some of the most amazing sunsets and the Sea World fireworks in summer. Being up on this deck truly feels like you are almost on top of a water wonderland. Romantic and peaceful, you can see miles of sand and overlook beautiful Mission Beach, La Jolla, downtown San Diego and the surrounding hills. Enjoy the luxury of five TV's in the living room and bedrooms, WiFi, unlimited long distance non-international phone service, ceiling fans, central heating, hairdryer in each bathroom, iron & ironing board, washer & dryer. We provide 2 pack n plays, crib, high chair and step stools in each bathroom. The stairs are protected by gates. For beach fun you can find beach towels, beach chairs, umbrella, boogie boards and plenty of sand toys. The house offers everything you might possibly need, including supplies such as: laundry, hand, dishwasher and dish soap, toilet paper, paper towels, kitchen sponge and of course all fresh, spotless and clean linens and bath towels. Please note we do not replenish supplies. The garage easily fits two mid-sized SUV's. Please note that the house has fans and a nice ocean breeze flowing through but there is no AC. 95% of the year AC is really not needed at all but please be advised that when temperatures go over 85 degrees in San Diego (which rarely happens) the house will feel warm. The max occupancy limit is 10 people, including any day visitors. We can not agree to more than 10 people at any time at the premises. For "friend/adult only" groups we can agree to 8 people max and ALL must be over 35 years old. We absolutely do not want to rent to anyone that is intending to party at the house. We have a NO smoking and NO pet policy. Please understand that people with allergies (renters as well as people in our team) count on the fact that the place is kept "pet free" and we wanna stand up to that promise. We would very much appreciate if people that plan to bring a service pet try to find a place that is pet friendly (please!). Once we received your request to book, we will email you a rental agreement for an electronic signature. Once it has been filled out/signed by you and agreed to by us, we will then charge your credit card for the down-payment and confirm your booking. No money will be held or charged from us until you signed the rental agreement. Please note that at rare occasions we might not be able to move forward if a time frame requested does not fit well in our calendar. In this instance we will ask you to shift your dates or offer you alternatives if available. 25% of the room rate will be due upon reservation (once rental agreement has been signed). The remaining balance will be due 30 days prior arrival. Once paid these amounts are non-refundable. You do have the option to purchase travel insurance. We will send all details once your booking is confirmed. Pacific Sands Vacations, Inc. is a vacation rental management company that offers finest homes along the beach and bay in San Diego. Our mission is to provide our customers an excellent experience all around. We are a very hands on team focussing on attention to detail, highest cleaning standards and great comfort. Our goal is to make our guests feel home away from home when staying at any of our vacation homes. Perfect setup for a family vacation. Everyone can have their own space and there are big enough spaces for everyone to gather. Loved it! Stocked with everything a stair gates were awesome! Never had to worry about the toddlers. Very comfortable and beautiful home. Super location. Perfect location to take in the Pacific Ocean sunsets. The house is beautiful and we had everything we needed. This property is by far the best place we've stayed in Mission Beach in terms of a beach house rental and we've been visiting this area for over 15 years. The layout of the house is perfectly suited for 1 or 2 families looking to spread out and still have the comfort of private bedrooms and bathrooms. The common areas are towards the upper levels of the house and afford the best views of the Pacific just 2 houses away. The rooftop provides panoramic views and should not be missed at sunset. I now understand what the big deal is with having a rooftop deck with comfortable seating and a fire table. The house is very well stocked with everything you can imagine for cooking and entertaining to spending the day at the beach or bay. The condition of the house was spotless and ultra-clean. Everything in the unit is well stocked and labeled for ease of use. There are so many great attractions close by for eating, drinking, coffee, and tacos. Pro-tip: Ralph's and Von's offer free delivery on groceries including ice and spirits. The property management team was incredibly responsive and helpful. Definitely a place where we will be returning in the future. Mission Beach has something for everyone: dining, biking, boating, kayaking, rollerblading, surfing, sailing, swimming and any manner of water sports within walking distance. AND, just minutes to world class attractions: Sea World, San Diego Zoo and Wild Animal Park, Balboa Park with first class restaurants, museums, theaters and attractions, LEGOLAND, The Gas Lamp District, Old Town, UCSD aquarium. For the further adventures, take a short drive north to Disneyland, Wild Animal Park, Knotts Berry Farm and Los Angeles. To the south is Baja California and Tijuana, or east to the La Puerta Spa at Tecate, and the south east desert. For a little Las Vegas at the Beach, there are several casinos within a short drive. San Diego is rich with culture, adventure and peaceful pursuits. Whatever you wish is most likely available. Enjoy Seagirt House - your dream destination.